I enjoyed making yesterday’s painting so much (in my mixed media journal) that I thought I’d try to make a few adjustments, and recreate it on watercolor paper. Thanks again to Bella, for the fabulous photo! If you prefer one over the other, I’d love to hear which one! I seem to be pretty hooked on coneflowers lately, hehe. I hope you’re making a splash somewhere wonderful today! Peace. Like the colors in this watercolor. Thanks! This one makes me think of a rainbow. I like the larger expanse of sky here. Thanks! I feel like it needs more depth. The other one had more contrast and immediacy too, I think. I do think I prefer the sky in this. Thanks for pointing that out! I do know – I so get it! When I have no intention is when I think I do my best…. Boy, I hope that goes away with more practice because I would like, at some point, to intentionally paint something and it actually come out also. Argh. Lol. I like them both for different reasons, but my taste tends to run towards the simplicity of the first. Ok, thanks, Kathy. Much appreciated. They are both very beautiful but I prefer the first one because the flowers and bird are very distinct. The colors are great in both. Thank you so much! I may just need to add more color to get more depth in the newest one. Hi Laura – if you are asking for favorites I do like yesterday’s. This painting today makes happy though because of the bright color. Now you need to paint a third for a triptych. Thanks, Sharon! Do you think this one needs more contrast/depth? Can you put your finger on why you prefer yesterday’s? I think what happened is the background took over the painting. The bird and flowers get lost. 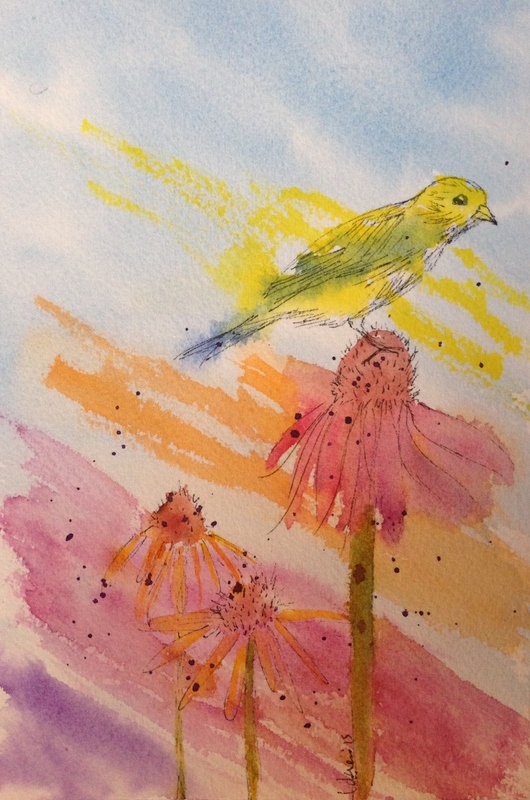 Add some darker background tones around the bird and flowers. Have fun. I like both however yesterdays calls me. The bird and some flowers are lost in the background of this one. We need a third one! Thanks, Carmel!! :))) Mayhaps I’ll try it again! I worry a bit about losing the spontaneity of the first one though. i like them both, but I think I like yesterdays a little more only because of the stronger purple in the flowers. Thanks, Carol! I may try for a third. I haven’t seen yesterday’s, but today is a beautiful creative arrangement – the loose style and soft colors are a wonderful combination. Thanks Mary! That’s what I was going for! Thanks Jill! I think I prefer today’s but I’d prob like it better w some deeper darks. Needs more contrast I think! Yesterday’s was more impressionistic but both are equally beautiful! Thanks! Both of these were so much fun to do. I love just creating for the joy of it! Thanks, Margaret! I appreciate your feedback.